I've been on some pretty amazing adventures since I checked in last. 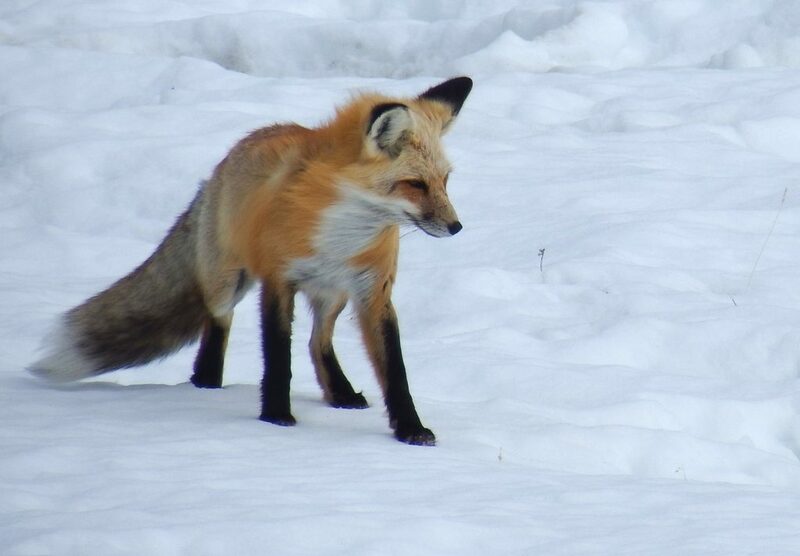 The most inspiring was a five-day wolf-watching trip in Yellowstone National Park (which I blogged about on my werewolf site because, well, wolves). 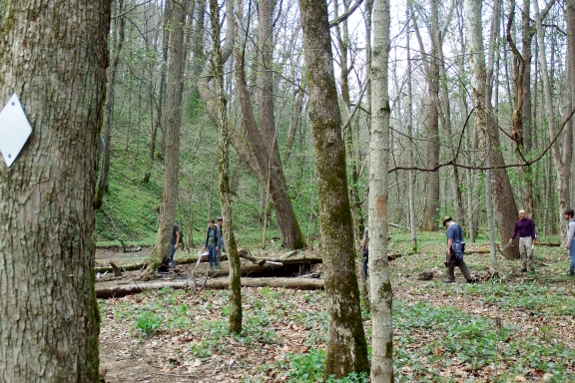 More relevant to this blog is the mushroom foray I attended yesterday in Wildcat Hollow outside of Glouster. 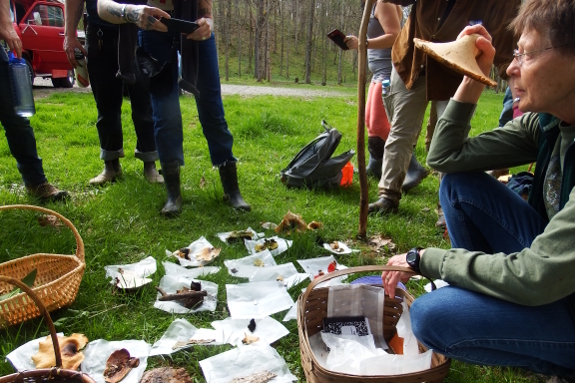 This was such a delightful adventure, like an Easter egg hunt in the woods searching for every kind of fungus we could find to be ID'ed by pros then uploaded to a website for inventory purposes. 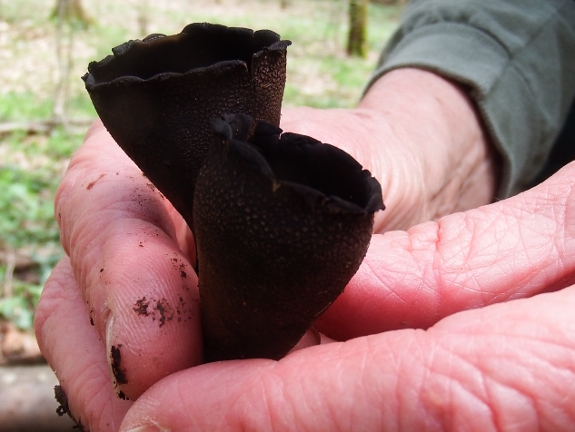 Most of the mushrooms we found were just pretty, like this Devil's Urn. Some weren't even pretty --- drab and dried fruiting bodies from last year. And then there were the medicinal/edibles, about which I took extensive notes. 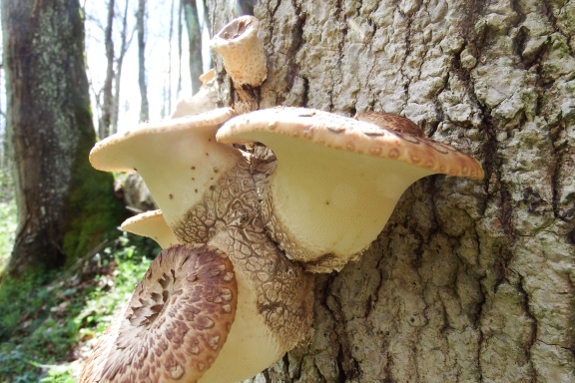 I'll start with the Dryad's Saddle, which I'd seen many times before. But I'd never understood that the young ones are such choice edibles, identified both by their unique visuals and also by their even more unique cucumber scent. Chop up any that are tender into thin slices then saute for about ten minutes until well cooked,and I suspect you'll find them as complexly delicious as Mark and I did. The Wood Ear is used widely in Asian cooking, so I might have actually eaten this one before without knowing it. It's a jelly-like fungus, growing on live wood. I haven't cooked my sample yet --- tomorrow's experiment! Do not, however, nibble on these Deadly Galerinas. Their orange-tan color is relatively distinctive and they grow in a similar habitat to the edible Honey Mushrooms. If in doubt, throw it out! Moving on to medicinals, I enjoyed a side-by-side comparison of False and True Turkeytails, finally wrapping my head around the differences. 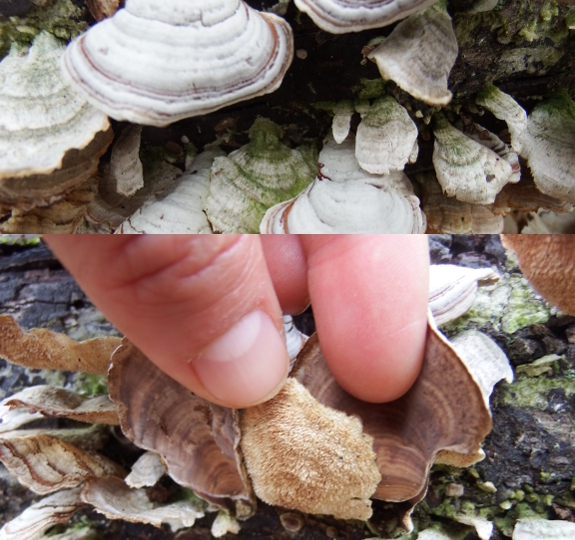 True Turkeytails are polypores, fuzzy on top and rough on the bottom. False Turkeytails are parchment mushrooms, smooth on both sides. These images are last year's fruits, so both species have faded a lot. But I now feel confident I could pick the True and not the False. The image above is just a small sampling of our haul, shown in all its glory. Martha from the Ohio Mushroom Society rattled off scientific names so fast most went in one ear and out the other. But I joined up and will look forward to learning more during our next foray! 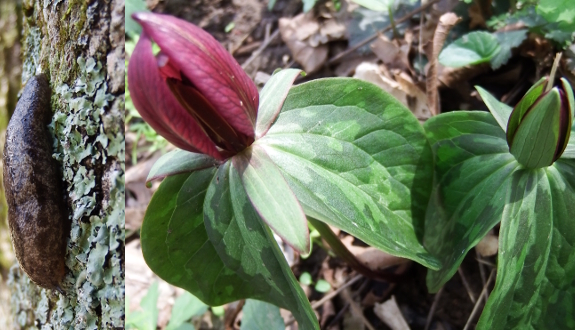 I can't resist ending with at least one of the many stunning wildflowers that graced this trail. Go outside --- it's the most beautiful time of the year!